This week’s Torah portion of Toledot presents us with one in a multitude of conflicts between siblings and the challenges of parental favoritism. We read of the brothers Jacob and Esau and with whom the destiny of the divine promise bestowed on their grandfather, Abraham, will be carried. This destiny—this birthright—is first outright sold by the older Esau to his brother Jacob for a pot of lentil stew. But the more valuable ancestral blessing can only be given by their father, Isaac. In Genesis 27, we find Isaac old and blind. Before he passes on, he must bless one of his sons to ensure the passage of God’s promise from one generation to the next. Rebecca, Isaac’s wife and mother of the twins, insists that Jacob, the younger of the two, should inherit this promise and blessing. Although Esau is the stronger of the two, Rebecca sees in Jacob a spirit and a mind that is more fitting to be the father of a nation. As we know today, Jacob gets a new name: “Israel,” and all his children and we here today, are called, “B’nei Yisrael,” the Children of Israel. She has Jacob disguise himself enough to fool his father into thinking him to be his hairier brother, Esau, and he is successful in receiving the blessing from his father. In this story, much of the responsibility of blame is not on Jacob performing this deception, but on Rebecca, who says, “Upon me be thy curse, my son; only hearken to my voice.” [Gen. 27:13] And at the same time, what of Isaac? Is he truly blameless and thoroughly blind to this rouse? The 20th century Reform rabbi and author Gunther Plaut argued that Isaac was not really deceived. Reading the story with close attention to the personality of Isaac, Plaut concluded that throughout the episode, Isaac was subconsciously aware of Jacob’s identity, but, as he was unable to admit this knowledge, he pretended to be deceived. Plaut thus saw a plot within a plot, as Rebecca and Jacob laid elaborate plans for deceiving Isaac, while unknown to them Isaac looked for a way to deceive himself, in order to carry out God’s design to bless his less-loved son. Plaut argued that Isaac was old but not senile. In his heart, Isaac had long known that Esau could not carry on the burden of Abraham and that, instead, he had to choose his quiet and complicated younger son Jacob. In Plaut’s reading, weak and indecisive man and father that Isaac was, he did not have the courage to face Esau with the truth. His own blindness and Rebekah’s ruse came literally as a godsend. 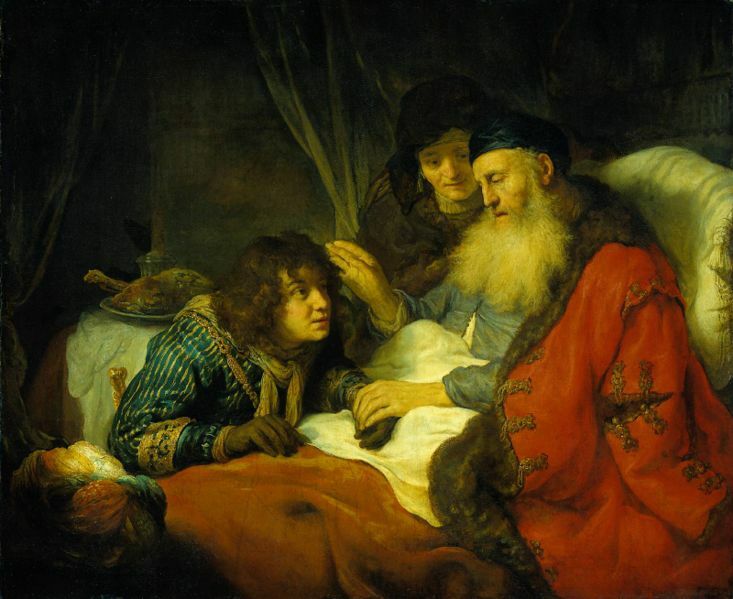 Plaut noted that Isaac did not reprimand Jacob. Plaut concluded that no one, not even Esau, was deceived, for even Esau knew that Jacob was the chosen one. Sometimes we act blind to the acts of others in order to give them the benefit of the doubt when they act basely. Other times we wear a veil that shields our eyes from actions which we know need to be taken, but have trouble reconciling with our moral compass. It is the challenge of being a parent: Sometimes our children must get hurt in order to learn how to avoid pain. And at the same time, we sometimes need to avert our eyes when our children act in ways we know they must despite our reluctance to fully endorse their actions. Is it deception? Is it lying? Are we fooling ourselves, or is honesty always the best policy? The world is not black and white. Sometimes the shades of grey are so gradual that it is challenging to determine whether our actions are right or wrong. What is most important is that we be thoughtful and reflective on our deeds. In this way, we may gain more enlightenment and lift our own personal veils.